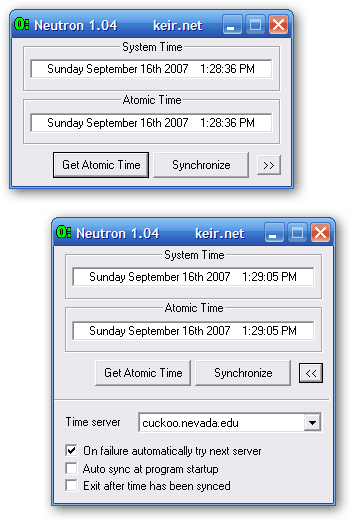 Neutron is a very simple and small time synchronizing program that retrieves the accurate time from one of several specialized time servers on the Internet. Once the network time has been retrieved the program can set your computer's clock to match it. Options in the program enable you to automatically obtain the time from the time server and set your clock appropriately at program startup. It is also possible to have the program automatically exit after the time has been set and so is ideal for placing a shortcut in your Startup folder to sync your clock when your computer is started. Neutron uses the standard Time protocol (UDP port 37). See RFC 868 for more details. It is not an SNTP (UDP port 123) client. The time retrieved from the network time server is given as the number of seconds since midnight on January 1st 1900. Since the protocol only allows accuracy down to the second you may not get the most accurate time possible but it is usually good enough to always be within about half a second of "true" time. Network latency is accommodated in the calculations involved in setting your computer clock. Clicking the setup button ">>" shows you the program options. Clicking the same button will hide the options. The setup options allows you to choose the time server that is used by selecting from a preset list in the drop-down list. You may prefer to use one that is located nearer your computer for faster responses. Select whether you want the program to automatically try the next server in the list if it cannot resolve or obtain a reply from the current one. Select whether you want the program to automatically obtain and synchronize to the network time when you start the program by clicking in the "Auto sync at program startup" checkbox. Select whether you want the program to exit after it has synced your clock time by clicking in the "Exit after time has been synced" checkbox. If you have this option set, the next time you start the program you can prevent the program from exiting by de-selecting this same checkbox. Added a message box warning for Vista users if the time couldn't be synchronized due to lack of rights to change the time. Wasn't syncing on next successful server if program failed to resolve or connect to server when auto-retry was enabled. Made the program a little more responsive if attempting to close it during a long succession of connection failures or if no network connection is currently established. Updated list of time servers (credit goes to Andrew Poth -- thanks!). Removed TCP/UDP options (now only uses UDP internally). Added automatic retry next server on failure option. The midday 12 hour was being displayed as 0 instead of 12. Typing mistake. "31st" would be displayed as "311st"! Bug fix. Wasn't properly taking into consideration Daylight Savings.